Girls has a peculiar rhythm that invariably makes its season finales feel like potential series finales. It’s common for television writers to craft season finales that could serve as a final goodbye if necessary. But it’s uncommon for a show like Girls, which has never been put in the precarious position in which its writers have build a story without any indication as to whether that story is going to end or continue. It’s now customary for HBO to announce another season of Girls before the upcoming season has even premiered, so a Girls finale can end on whatever note Lena Dunham, Jenni Konner, and Judd Apatow want it to. 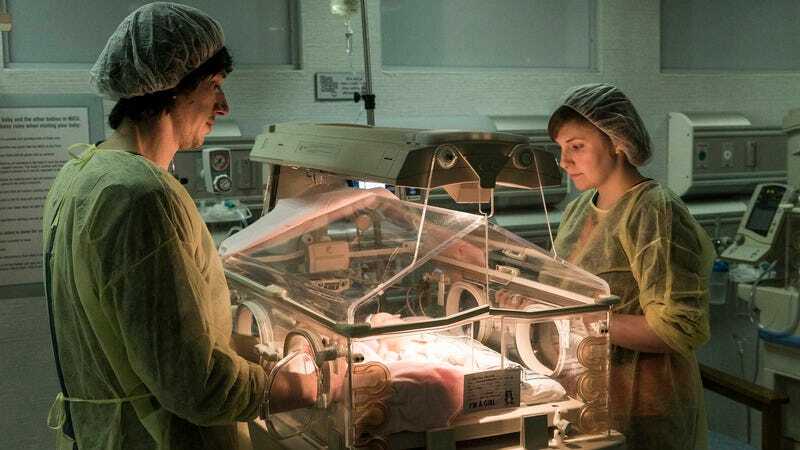 And yet “Home Birth” continues the Girls tradition of a season finale that splits the difference between conclusions and new beginnings in a way that feels like a natural resting place. To the credit of Dunham, Konner, and Apatow, who wrote the episode, “Home Birth” is executed differently than any other Girls finale. In its final moments, Adam tells Hannah he and Mimi-Rose are through, and he seems to expect Hannah to breathe a sigh of relief and welcome him back into her life. At the very least, Adam is probably assuming Hannah has lapsed back into all her most neurotic behaviors—it’s not an unreasonable assumption after the events of “Ask Me My Name”—and will deign to take him back because she needs him to anchor her, much like she did after his relationship with Natalia ended. It’s actually Adam who’s begging to be anchored, which is understandable given the woman with whom he just ended a relationship has black belts in manipulation and gaslighting. Dunham and Adam Driver perform the hell out of the scene, and while there was probably a temptation to give Hannah a cutting speech about how she’s moved on, the writers make the more graceful choice. “I can’t,” Hannah repeats. It’s not really about how she feels about him anymore, it’s about what she can bear. Adam can’t work for Hannah. Not now. After a six-month flash-forward, the first ever to occur within an episode if I’m not mistaken, Hannah is shown frolicking in the snow with Jake Lacy’s Fran, who in the cold open soothes Hannah’s nerves when she’s having a panic attack. It’s a terrific reveal assuming the writers are willing to pursue their relationship for an extended period of time. If that means Adam Driver has ended his run with Girls, at least in the short term, that’s probably for the best. Every season finale has ended with a temperature check on Hannah and Adam, and that has given their relationship a weight I’m not convinced it should have. A phase characterized by fumbling through brief, tumultuous relationships is something that has to happen around Hannah’s age, or not at all. Those relationships help clarify what’s important in a partner, illuminate strengths and weaknesses, and serve as important reminders that there are people whose views of the world differ. Aside from a couple of brief dalliances, Girls has never shown Hannah in a relationship with anyone other than Adam. Because these characters are at an age when people evolve rapidly, the audience understands them through their relationships and how those develop. For all the beauty of eternal bonds, putting Hannah in an indefinite relationship limits how much the audience can grow to understand who she is. It’s a good time for a change. There’s a question mark on the show’s other big relationship, the betrothed Marnie and Desi, after Desi skips out on the showcase that’s supposed to introduce their emotionally complex folk music to the world. I wouldn’t have believed this time last week that I’d enjoy a Marnie and Desi storyline quite this much, but this one was completely satisfying. It helps that it contains so little Desi, and most of what’s there consists of him staring blankly while Ray tears into him about how much of a dirtbag he is. Ray Ploshansky deserves far better than Marnie, if only because she’s too emotional and needy, and now that he’s a community board member, he needs a more regal, Jackie O type. That made it no less exhilarating to watch Ray take Desi apart with such stunning precision and absolute candor. I certainly hope the implication is that Ray’s diatribe triggered the raging imposter syndrome just beneath Desi’s earth-papa exterior. The Marnie and Desi story was also really funny, as is all of “Home Birth.” Spike Jonze appears as the mysterious label head Marcos and absolutely kills it, including a mini-runner in which he keeps insinuating that Desi is probably dead. When Ray convinces her to soldier on without Desi, Marcos offers to play along with her but she declines: “No…I’m pretty good too.” Allison Williams’ reading of that line is perfection. Just when I thought this would be the year of Girls in which Marnie never gets me to laugh with her rather than at her, she lands a blow with only minutes to spare. Even Jessa was more likable than usual, which she accomplished by not being the worst person on the planet at all times. She got to be the calm one for once during Caroline’s disastrous home birth, and she concludes she wants to make a living out of talking people down. Seems like a stretch, but who knows where Jessa might end up? This is the first time the audience goes out of a Girls season knowing the minimum amount of time that will have passed when it next sees the characters. That’s the beauty of being in your 20s. If ever your life can change dramatically within the span of six months, it’s then. So…Shosh is moving to Japan then? I didn’t even hate Marnie’s performance. It was pretty! But it’s a shame the audience didn’t get to hear “Kokopelli Shellie.” Seems like a missed opportunity. Jessa-Hannah Bluebell Palm. It could be worse.